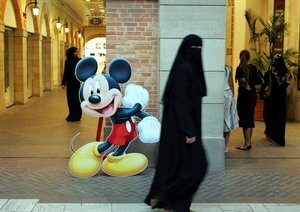 SAUDI ARABIA Saudi religious leader proclaims fatwa against Mickey Mouse, "an agent of Satan"
Saudi religious leader proclaims fatwa against Mickey Mouse, "an agent of Satan"
The condemnation stems from the principle expressed in Islamic law according to which "mice are to be exterminated". In August, the author described the Beijing Games as "the Bikini Olympics" because of the way the female athletes dressed, and condemned them. Washington (AsiaNews) - "Is Mickey Mouse an agent of Satan?". This is the question being asked today in an editorial in the Middle East Times, commenting on the fatwa issued by a Saudi religious leader, Sheikh Mohammed al-Munajid, according to whom "sharia, or Islamic law, calls for the extermination of all mice. That includes the common house mouse as well as the famous cartoon mouse". "The mouse", the sheikh explained in a television interview reported by MEMRI, the Middle East Media Research Institute, "is one of Satan's soldiers and is steered by him". The newspaper uses these comments as an occasion to ask King Abdullah, who is making efforts to bring greater moderation to Islam and foster interreligious dialogue, to find a way to rein in these "experts", who are often interviewed on television, and give religion a bad name with this "saga of outrageous fatwas". The editorial recalls that Al-Munajid was a member of the department of Islamic affairs for the Saudi embassy in Washington, before being "cashiered and sent back to Saudi Arabia". "The problem is that he - and others like him - continues to make harebrained statements such as this one, or yet his earlier rant of Aug. 10 when he took on the Beijing Summer Olympics. The sheikh decried the world's major sporting event as the 'Bikini Olympics' and lashed out at the 'immodest dress' worn by female athletes. He is reported to have issued a fatwa banning women competing in the Olympics; an event he also labeled 'satanic'". Three years ago the same sheikh, according to Religious Intelligence, an English organization that specializes in religious news, had called for a ban on football, because the shorts worn by the players "reveal nakedness".